The 2017 version of the Cornhuskers, Mike Riley’s third and final go-round in Lincoln, will be remembered for its utter inability to run the ball and stop the run. Teams like that generally end up with sub-.500 records, something which Riley and the 4-7 Huskers are now guaranteed for the second time in three years. 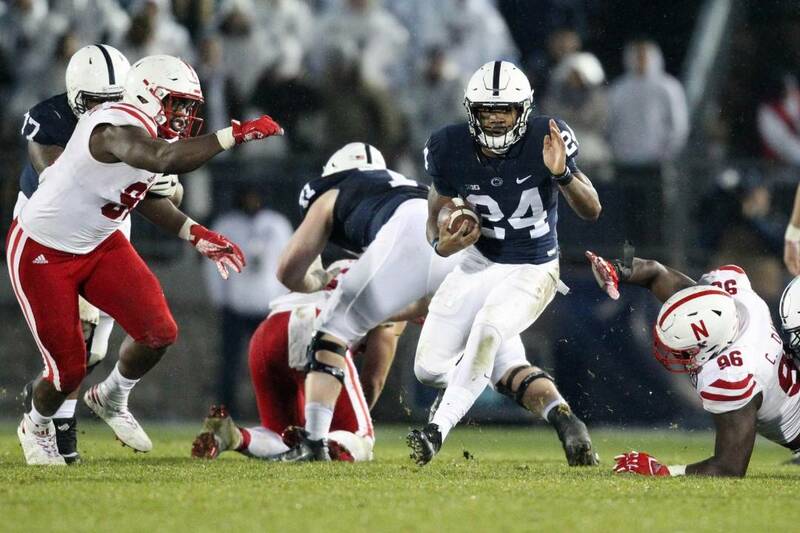 Penn State’s 56-44 win over Nebraska could have been much, much worse had PSU coach James Franklin decided to let running back Saquon Barkley and quarterback Trace McSorely play the entire game. As it was, Franklin’s offense ripped the defensive unit formerly known as the Blackshirts to shreds only for one half of football, then sat back and let a bunch of second- and third-teamers take the field throughout the second half. Barkley was a strong contender for the Heisman Trophy throughout a torrid September. He had failed to rush for 100 yards in any of the last three games, but Nebraska’s defense did all it could to revive his Heisman hopes once again. He piled up 158 rushing yards and three touchdowns, even though he carried the ball only three times in the second half. McSorley had 371 total yards and accounted for four TDs, yet had just nine total offense attempts in the second half. Whenever the Nittany Lions were serious about moving the football, they could do anything they wanted against the badly slumping Husker defense. Riley is on record saying his team has no issues except for the games. I think he’s being a bit too modest. Actually, the only things he team really struggles at are blocking and tackling. If he could convince the NCAA to start a 7-on-7 league, Riley’s teams would be a threat to make the playoffs. Instead, Riley is threatening to become the first man to lose his final four games as the Nebraska football coach since Bernie Masterson in 1947 — and Masterson had a lot less talent to work with than Riley. Back in February, I was excited about Bob Diaco joining the Husker staff. I thought he would inject the defense with new life. Turns out I was dead wrong about Diaco. The only thing he’s done well is make excuses for himself and his players. He seemed to pump the Husker defenders full of life during spring drills with his high-energy antics on the practice field. But his refusal to coach from the sidelines (he prefers to sit in the press box) has robbed the defense of that energy when it really counts, during games. It becomes more evident with every passing week. Early this season, Nebraska’s defense played well enough to beat Northern Illinois and looked respectable against the weakest of the Big Ten, Rutgers and Illinois. But since then, Diaco and his charges have been on a slide that keeps getting steeper. Diaco just accomplished something that not even your 70-year-old grandpa has ever seen. Nebraska has now allowed 50 points in back-to-back games for the first time since 1945. That’s some kind of spectacular failure. In 2007, Kevin Cosgrove’s Husker defense allowed 37.9 points and 232.2 rushing yards and 476.8 total yards per game. This season through 11 games, Diaco’s defense has allowed 34.6 points, 205.8 rushing yards and 429.9 total yards per game. So they’re not quite down to Cosgrovian levels, but they’re getting worse week by week. Diaco’s 3-4 defense was supposed to bring block destruction to Lincoln. Instead, it has featured tackling insecurity. It appears the Husker secondary decided earlier this week to make it optional to wrap their arms around their opponent when tackling. Both Nebraska’s cornerbacks played shoulder-bump football and looked ridiculous doing it when Penn State receivers ran past face-planted Husker DBs and ran free in the secondary. Diaco freely admitted after the game that the Huskers are failing miserably on defense these days, but said better days are around the corner. Too bad Riley and Diaco have disqualified themselves from the chance to see those days. Diaco supposedly specializes in stopping the opponent in the red zone. that just isn’t happening. The Nittany Lions were in the red zone seven times Saturday and scored seven touchdowns. Diaco came to Lincoln and sold Riley and the Huskers a bill of goods. The bill is coming due. Give him the “Snake Oil Salesman of the Year” award and send him packing with Riley and most of his staff. Diaco’s utter failure on defense had at least one positive effect: it prompted Franklin to substitute early and often in the second half to get all his seniors into the game and cleared the way for bushels of garbage time yards and points for Tanner Lee and the Huskers. Lee completed 7 of 19 passes for 72 yards and no touchdowns in the first half, and the game was decided by halftime, when the Huskers trailed 42-10. Lee made some good throws, but padded his stats against second- and third-teamers. Lee has the handicap of playing behind Nebraska’s worst offensive line in decades, but even though he can’t hold a candle to Zac Taylor or even Joe Ganz when it comes to making big throws in big situations, he may still have an outside shot to become a free agent backup quarterback in the pros. I hope he’s fighting for an NFL job next summer and makes a 53-man roster somewhere.